Tartan Day 2018 | Official site of Tartan Day | Washington D.C. The National Capital Tartan Day Committee, Inc; (“NCTDC”) is a 501(c)(3)-certified charitable nonprofit organization, incorporated in Washington, DC in 2004. 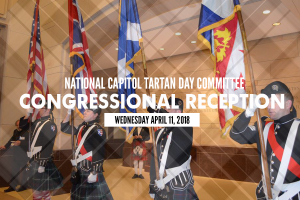 NCTDC’s sole mission is to promote the National Tartan Day holiday on or about 6 April each year, as recognized by Standing Resolutions of both houses of the U.S. Congress. To advance its mission, each year NCTDC sponsors a Symposium that addresses various subjects of interest to the Scottish-American Diaspora. Together with the bipartisan Friends of Scotland Caucus in the Congress, NCTDC also sponsors a Reception each year at the U.S. Capitol to recognize and honor the many contributions of Scots, and Scottish-Americans, to the foundation and subsequent development of the United States. 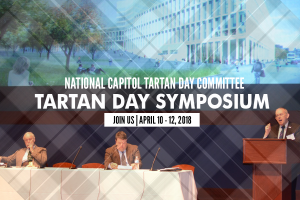 The 2018 Tartan Day Symposium will extend over three days—from Tuesday, 10 April through Thursday, 12 April 2018. All sessions for the 2018 Symposium require advance reservations and the purchase of tickets, either by check, made out to “NCTDC,” or online, via PayPal, here. An RSVP List will be maintained at the door for each session of the Annual Symposium. Ticket price for all Tuesday’s events–includes opening Tartan panel with Sir Malcolm MacGregor and others, welcoming speeches (including Joni Smith), evening buffet & reception (open bar plus scotch-tasting), and evening speech by Donald Maclaren–$50. Ticket Price for Wednesday’s events – panel on Scottish DNA update, plus Former First Minister Henry McLeish’s speech–$20. Ticket price for Thursday’s events – two panels (including the one on Scots Heraldry with Lyon Morrow, Dunrossil, Durie and others), the one on how Tartan Day is celebrated elsewhere in the USA, and the opening speech by Lyon–$30. Special ” package discount” for symposium–special reduced Master Ticket Price for all three days of panels and speeches–$85 total (a $15 savings over a la carte). Wednesday Capitol Hill Reception (includes buffet, open bar, scotch-tasting, Scottish entertainment, speeches and awards–Suggested Donation–$35. The program for the 2018 Symposium is listed below. The Wednesday afternoon Capitol Hill Reception on 11 April is “by invitation only” and there is no charge to attend. But to be added to the Guest List, all must register through the NCTDC Website (www.dctartanday.org ). No fee can be charged to attend any event on the U.S. Capitol grounds; however, NCTDC does incur costs to put on the Capitol Hill Reception as well as the Symposium. Accordingly, persons wishing to attend the Capitol Hill Reception are asked to make a voluntary donation to support the work of NCTDC. (Suggested amount: $35.00.) This can be done by check, made out to “NCTDC”, or online, via PayPal, through our Website. All donations to NCTDC are tax-deductible. · Siobhan MacKenzie, Scottish dress designer who incorporate tartan motifs in her fashions, named Young Scottish Designer of the Year for 2016. The St. Andrew’s Society of Washington, DC annually sponsors a national Kirkin’ of the Tartans and has done so each year since 1941 .In recent years, NCTDC has co-sponsored this event along with the DC St. Andrew’s Society. The National Kirkin’ of the Tartans was originally conceived by the Rev. Dr. Peter Marshal, Chaplain of the St. Andrew’s Society, and of the U.S. Senate, and a native Scot, as a fund-raiser for the British war effort in the dark days of 1941, after the fall of France but before Pearl Harbor, when Britain stood alone against the Axis Powers in Europe and the Pacific. The Kirkin’ was moved to the Washington National Cathedral in 1954 and has been held there each year since then. Attendance is open to all, at no charge. No tickets or advance reservations are required. The wearing of the tartan is encouraged by all, but not required. For more details, visit the Society’s Website at www.SaintAndrewSociety.org.